We’re in Quebec on a yellow zodiac, zooming across the St. Lawrence River in search of whales. 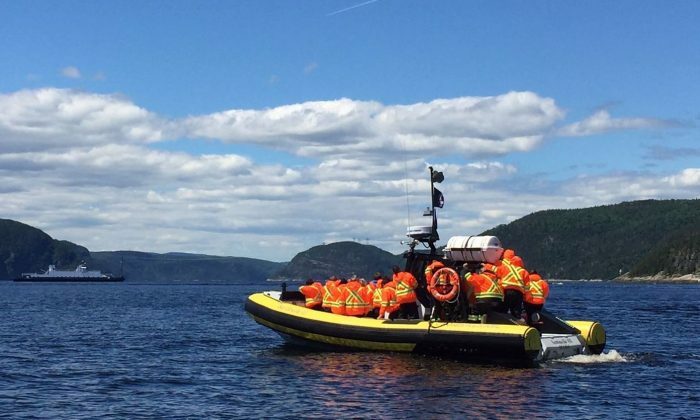 Captain Julie has taken us into the heart of the Saguenay-St. Lawrence Marine Park, a protected region so rich with whales that marine researchers come here from around the world. Sure enough, beluga whales appear up ahead, their white backs reflecting in the sunshine as they surface. Quebec may be known for its rich culture, unique history, and excellent food, but it’s also one of the best places in North America for whale watching. Thirteen species of whales, including blue, fin, and humpback, can be found in the river’s estuary and the Gulf of St. Lawrence. 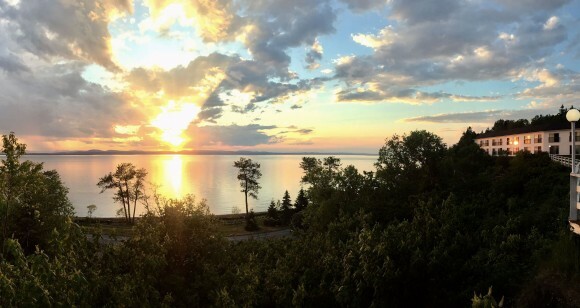 The mighty St. Lawrence, one of the world’s longest rivers, bisects southeastern Quebec. Maritime Quebec has more than 3,000 kilometers (1,864 miles) of coastline, with 40 lighthouses, 10 national parks, and dozens of towns and cities. Life here is centered on the river. Though watching the whales is what drew me to this region of Quebec, the rest of my travels here have been just as pleasant. After flying into Mont-Joli Airport, my friends and I drive 140 kilometers (87 miles) to Rivière-du-Loup. 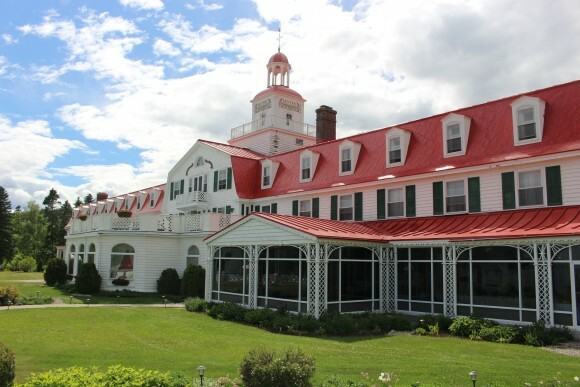 Our base is Auberge de la Pointe, a beautiful riverside hotel that has been in the same family since 1957. Many visit the hotel just to eat at L’Espadon, the popular on-site restaurant, or to enjoy the view from the terrace. This region is known for its beautiful sunsets. Well rested, we head to the tiny island of Ile Verte, home to 45 people. The island ferry is out for repairs, so we climb aboard a zodiac for the 15-minute ride. Life on Ile Verte moves at its own pace. There are no schools or big businesses and very few cars. Our taxi driver, Guy Langelier, drives us about on a stretch golf cart. A rock hunter by trade, Guy spends his summers ferrying guests around the island. 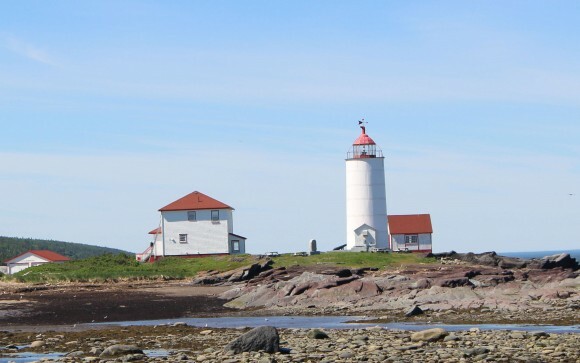 The Ile Verte tour package includes access to three attractions on the island: the Musée du Squelette, a unique museum filled with 300 animal skeletons; the École Michaud (the Old Schoolhouse), now a local museum; and the island’s well-known lighthouse, now a bed-and-breakfast called Les Maisons du Phare de l’Île Verte. The lighthouse is located on a stunning stretch of beach with unlimited views in both directions and has nine rooms available from mid-June to mid-September. 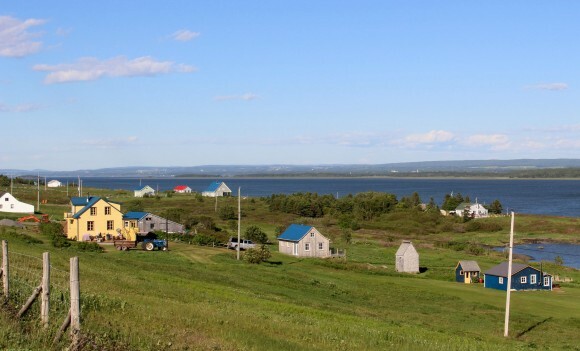 Just 13 kilometers (8 miles) long, Ile Verte is easy to explore. 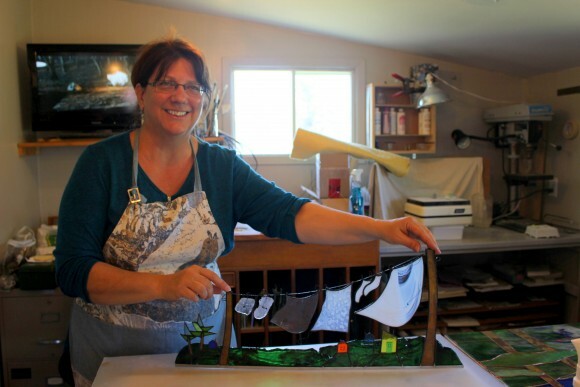 We stop for a drink at the tiny Cafe D’Alphe, then visited stained glass artist France Lalancette at her studio. For dinner, we call ahead to Café de l’Echouerie, a tiny home kitchen run by Michèle Dionne. With advance notice, she will make you a delicious seafood dinner. All we have to do is bring the wine. After ferrying across the river the next morning, we drive to Kamouraska. The town’s art galleries, chocolate factory, and other shops are popular with vacationers. My favorite place to stop for coffee is the Café du Clocher, where a chubby cat named Garfield entertains us. In Rivière-du-Loup, we board the ferry to Saint-Siméon ferry. Ferries are part of everyday life here along the St. Lawrence; this one carries more than 700 cars a day. 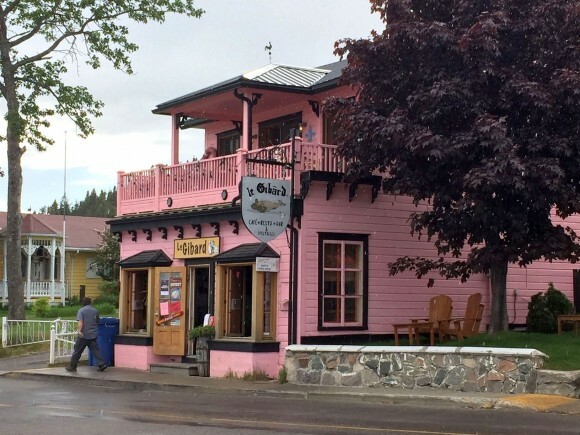 It has a restaurant and shops, and the 65-minute ride is quite comfortable. From Saint-Siméon, it is a 40-kilometer (25-mile) drive (including one more ferry crossing) to Tadoussac, our final destination. With an enviable location on the bay, Tadoussac is at the heart of the Saguenay-St. Lawrence Marine Park. Whales can often be seen from the shore. 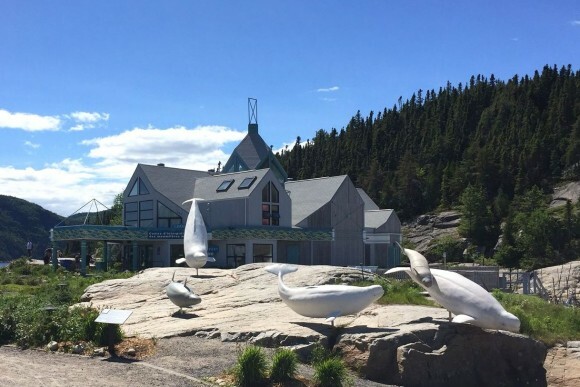 While many come to Tadoussac to see whales, the town is a destination all its own. We find a comfortable base at Auberge La Galouïne, a boutique hotel in the heart of town. It is just a five-minute walk to local restaurants and to the Marine Mammal Interpretation Center, a small but informative center dedicated to whales and marine life. 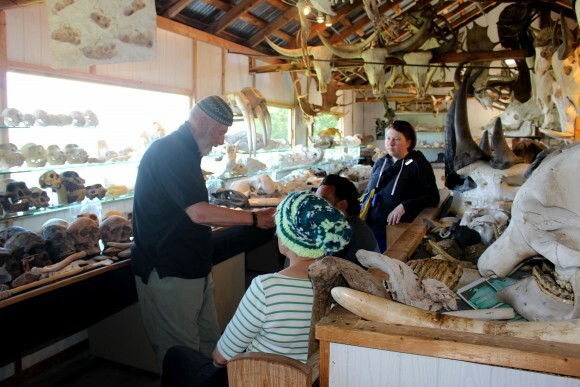 Whale researchers work at the facility, with some offering insights to visitors as they tour the center’s exhibits. One fun exhibit even offered a whale-singing course. Whale watching tours are offered next door by Croisières AML. Tours operate from April to the end of October. Our whale watching experience is the highlight of our trip. Out on the water, Captain Julie points out three minke whales on the right. From my perch on the zodiac, they are so close, I can hear them breathe. The sound is loud and powerful, and I am awed by the experience. My eyes follow them as they swim away, eventually disappearing into the depths of the river. Janna Graber has covered travel in more than 45 countries. She is the editor of three travel anthologies, including “A Pink Suitcase: 22 Tales of Women’s Travel” and is the managing editor of Go World Travel Magazine (GoWorldTravel.com).